President Muhammadu Buhari has commended the resilience of Nigerians living in Poland amidst complaints of open discrimination which he said has helped both countries maintain good relationships. 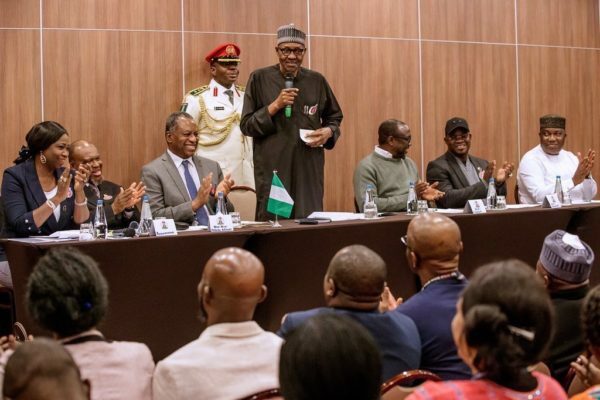 According to President Buhari during his interactions with Nigerians in Diaspora, at the KrakÃ³w Holiday Inn, Poland, he said that they were able to maintain good relationships with their host communities despite such cases of hostilities and racial discrimination, should be commended. The event was put together by Senior Special Assistant to the President on Diaspora, Abike Dabiri, as part of the Presidentâ€™s engagements on the sidelines of the global summit on Climate Change, taking place, in Katowice, Poland. The President had earlier been briefed about the challenges Nigerians face in Poland as well as their relative good behaviour despite the high level of hostilities and discrimination faced in Poland. President Buhari again, at the occasion, lamented Nigeriaâ€™s history of corruption and mismanagement of resources in the past years, said he would no longer complain but face the challenges head on. The President reiterated that although he inherited many problems, he will no longer complain about them. â€œWho asked me to do it again? President Buhari also said that his administrationâ€™s number one priority was security because of the understanding that investments drive would be useless without first securing the environment. â€œIt just make sense. You have to secure our country or even the institutions , or environment to manage it properly. If they are not secured, you are wasting your time. So, security has always been our number one priority. â€œThose in the North East will tell you that before we came, the so called Boko Haram used to hold about 17 local government, now, physically, they are not holding any local government, so they have resulted to real Gorilla tactics of hit and run. â€œThey mobilise, hit targets and then disappear again because they know the area more than the Soldiers that are defending them. â€œOur Soldiers are from Port Harcourt, Lagos, Sokoto, but they are locally there and know the terrain more than the soldiers. Earlier, the Nigerian Ambassador to Poland , Eric Adagogo Bell-Gam, while giving his welcome remarks, had revealed that quite a number of Nigerians in Poland were stable professionally and have what they are doing in that country. He also noted that there were quite a large number of Nigerians studying in Poland because of the relative cheap nature and quality of their educational system, comparable to anywhere in the world. The Ambassador lamented, however, that Nigerians were like other non-Polish citizens, subjects of racial discrimination, as according to him, â€œThere is a very high problem of animosity, dislike for foreigners. â€œA lot of them will tell you the story. Even in Nigeria, we have this spectacular problem of getting visas from their Embassy there.